Help maintain a healthy lawn using the D31RE to remove moss and thatch. 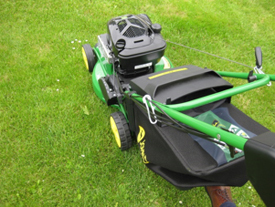 Lighweight yet robust, this machine is perfect for smaller lawn areas. Achieve straight lines with minimal effort: the straight-handle design makes it easy to push the mower forward. The clean design of the handlebar makes operation very intuitive. The stiff handlebar enables precise steering and efficient mowing under trees, around obstacles, and into corners, even on hills. Made of high-impact plastic for long life. Rim caps keep dirt outside the bearing area and are very easy to clean. The tread ensures good traction and steering while also reducing buildup of cut grass. Ball bearings or high-quality bushings ensure minimal push and pull effort. A small section in the middle of the tread sticks out to provide smooth and silent movement on hard surfaces - especially during initial assembly as well as transporting to and storage. The durable and attractive rear-discharge bag makes grass collection easy with the RUN mowers. Large capacity for long intervals between emptying of clippings. Bag design allows installation and removal in seconds. Textile baggers limit dust accumulation whilst plastic bags with their larger openings allow dust to exit easier. Bags are colored black to maintain a clean impression. Compared to a plastic bag, the textile bagger does not open when going up steps e.g., between patio and garden. The rear of the bag will be pushed up by contacting ground, but the flexible textile bag remains on the mower. A plastic bag will be completely pushed up at the rear, resulting in grass dumping. Scarifiers D31RE, D35RE and D38R can be equipped with an optional textile bagger. It features similar advantages as above. 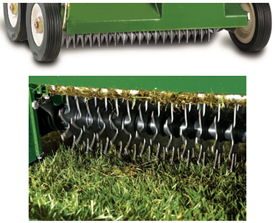 A number of robust steel blades stay sharp for many times of scarifying a lawn. The following table shows which machine uses what type of blades. The D45C is the perfect machine for rental or commercial application.